Winter months are the coldest months of the year in polar and temperate climates. But just because it’s cold during the winter months it doesn’t mean we have to refrain from taking our dogs out for a walk. However, when it comes to this, don’t assume that dogs’ fur makes them control the cold better than human beings. Dogs also feel cold. Because of this reason, taking your dog out for a walk during the winter months can be a very difficult and challenging task. Because these months are very cold, you need to keep your winter walk short. It is important to maintain your dog’s emotional well being by giving him enough time to play outside instead of keeping him indoors. However, don’t spend a lot of time in the cold because you will be hurting your dog’s health. Make sure to pay attention to your dog’s body language. That will give you a hint if he’s had enough of the cold and wants to go back home. 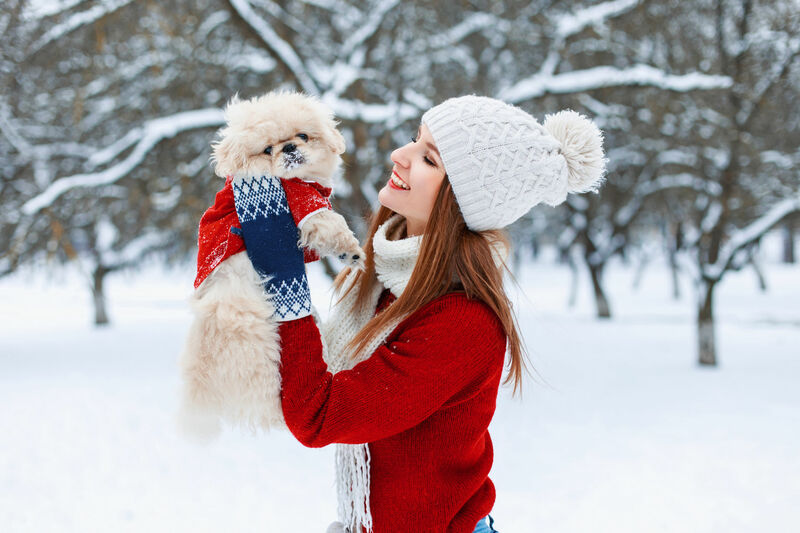 For instance, when you’re having fun with your dog in the cold and all of sudden you discover that he is shivering, don’t waste time or ignore that. rather. Take him home as fast as you can. 2. Make sure your dog wears a sweater, vest, and even dog pants. A dog sweater is an excellent choice when you’re both going out for a walk in the cold. Just like human beings, dogs also feel cold. If you’re dog is one them, keep him warm when you’re going in the cold by dressing him in warm dog clothes. 3. There’s no easy way to tell how solid the ice may be and you don’t want to risk you or your dog falling in. The best way to keep this from happening is to keep a very close watch on your steps. When walking your dog during winter, select a dog harness versus a dog collar because harnesses have greater control over where your dog walks when compared to a collar. Also, a harness is much more comfortable than a dog collar, as when your dog pulls away from you the force is spread across their body rather than directly on their neck. Snow seems so harmless but it can be dangerous. So when you’re out with your dog, keep a close watch on him to make sure he doesn’t eat snow. There could be bacteria or chemicals in the snow that could be harmful to your dog. Large consumption of snow can upset your dog’s intestines. This can cause vomiting and diarrhea. Before you go out on your walk, just let your dog have some water for hydration instead of getting hydrating by snow. 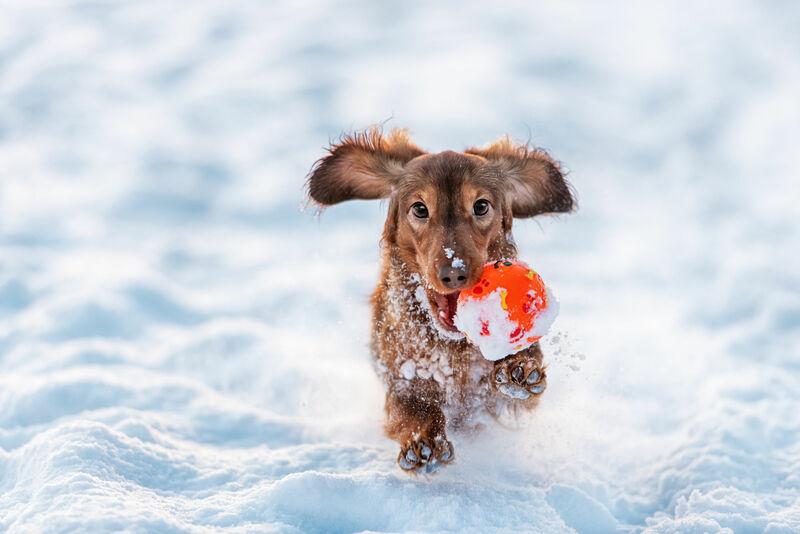 It’s no secret that dogs tend to eat whatever they find and as tempting as snow looks and as harmless as it seems, this can be a bad idea. So it’s better keep a close watch than to expose them to the risks of eating snow. Although, you might not see much antifreeze, don’t take the risk during the winter months, especially when you go on a walk and pass areas that may have this dangerous chemical. 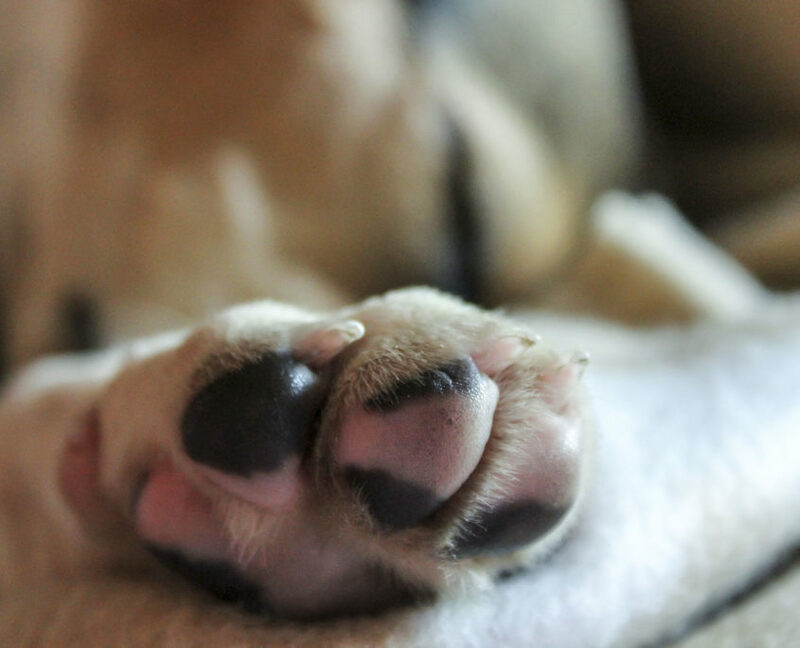 Because dogs are likely to get bacteria, ice or rock salt caught in their feet, which can harm their paws, you need to clean and wipe your dog’s feet carefully. To at least to minimize the damage to their feet, make sure you wipe them with a warm cloth when you get home from your outdoor walk. This will also prevent your dog from licking their paws and getting sick. In order to totally avoid this from happening, it’s smart to protect your dog’s paws with doggy mits. 5. Clean any salt and chemicals off your dog. 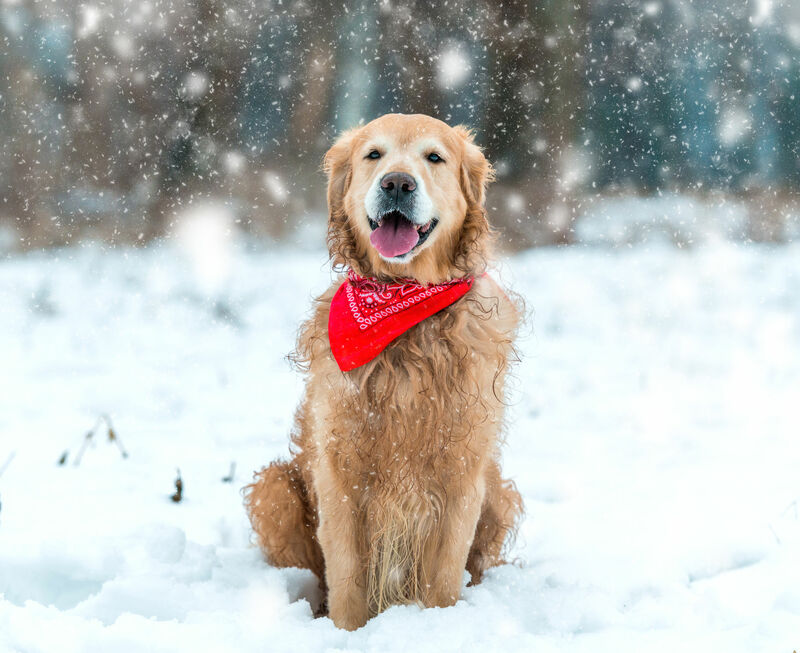 Finally, if your dogs play or walk outside during wet and snowy winter conditions, be sure to give them a thorough rub-down with a clean towel before they come inside. 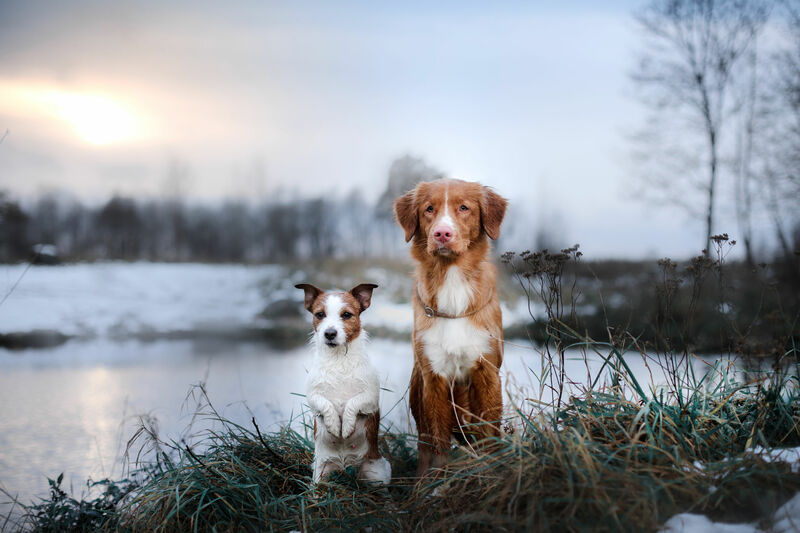 These are tips to help you figure out a safe way to take your dog outdoors during winter months. However, if you’re not comfortable with taking your dog out during cold seasons, then just stay at home. Don’t insist on taking him out if you’re not sure because you might end up harming your dog. John Alex is a resident pet care expert. He also curates a select range of vet recommended and approved products. He enjoys writing educational articles to help those who want to look after their pets all over the place. Check out his latest article about emotional support dogs. Does anything sound more tortuous than brushing your dog’s teeth? But like anything, tooth brushing is a habit that your dog can learn to love over time. Here are a few tips to help ease him into the process. Start now. If your dog is still a pup, you have an advantage. Not only is she easier to manage because of her smaller stature, but adopting this habit early will lead to a lifetime of good oral health. If your dog is older than the puppy stage, it’s not too late. Old dogs really can learn new tricks; it just takes a bit more work to make it stick. Start today and you’re one step closer to smooth sailing. Be consistent. Not only should you practice tooth brushing every day, but you should shoot for the same time each day. When your dog knows what to expect, it’ll get easier over time. At first, you may find that she runs and hides when that time comes. Don’t let this phase you. It’s normal. After some time, she’ll likely grow to enjoy the experience. Really! Find a tasty toothpaste. You know how they flavor kids’ toothpaste with bubblegum and cotton candy? That’s because kids like brushing their teeth about as much as your dog. Flavors are extremely important for getting your dog (or your kids) to enjoy getting their teeth brushed. If lamb is your dog’s favorite, find a lamb-flavored toothpaste. It may also help if you refrain from giving your dog this flavor in his food for a while. This way, the toothpaste will be a special treat. Make it special. This should be a bonding experience for you and your dog. If you think of it as torture, so will your dog. Be liberal with the belly rubs and praise throughout the process. If your dog sees this as something that makes you happy, she may be more likely to show up for it willingly. After all, dogs are people pleasers. Complement tooth brushing with other things. 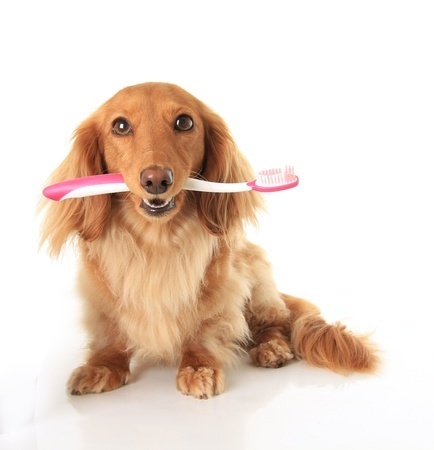 When you take other measures to clean your dog’s teeth, there won’t be as much pressure on the brushing itself. Try using an all-natural dental spray or water additive to help keep your dog’s mouth clean and healthy. If you do this, you may be able to shave some time off of each brushing session. Oral health is so important for our four-legged best friends, and it’s not something we can skip if we want them to live long and healthy lives. Follow the tips above to keep your dog’s mouth clean and you may avoid costly vet bills in the future. Christina Dillon is a freelance copywriter and dog health enthusiast. Read more about what she has to say about natural dog care products at Cheerful Canine. It’s challenging to find an apartment where you and your pet are welcome. The situation is entirely different when you own a house because you can just make changes to your home. But when renting, you don’t have the same option as owning a house. That’s why, if you’re a renter, it’s vital that you select the best apartment, not just for you, but also for your pet. 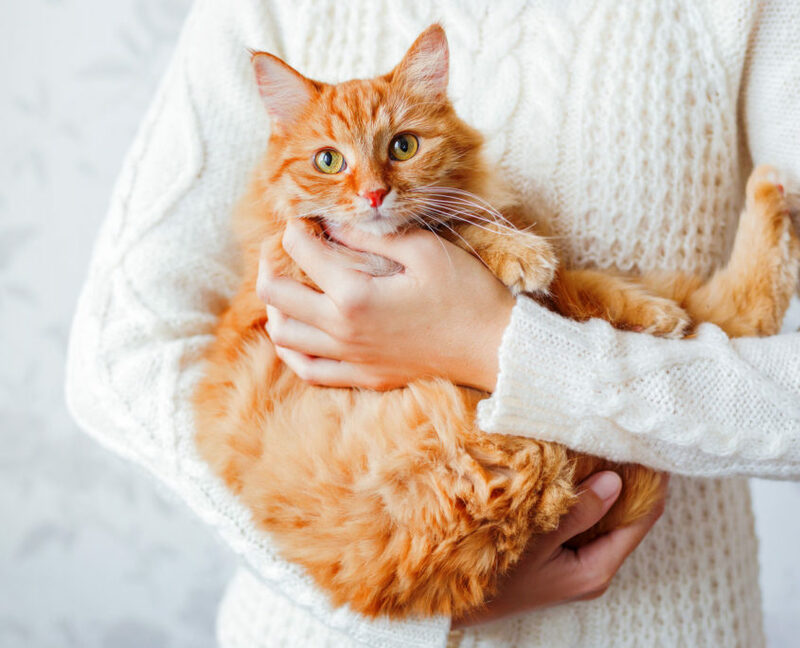 Despite the popularity of adopting pets, some landlords are still adamant about not allowing pets on their rental property. Thankfully, there are effective tips when renting with pets that you can follow. It’s evident that when you choose the best apartment for you and your pet, you must look for a rental property that encourages pets. However, you should look beyond the pet-friendly policies that allow pets on the property. Instead, look for other on-site amenities. Some apartments, although expensive, can provide dog walkers on staff, a walking trail, dog washing facilities, and others. They can even offer a private dog park. But never assume things if a building has a pet policy. It’s especially true if the policy isn’t explicit. Before you even sign papers, talk to the landlord and ask about the pet-friendly clause in the agreement. Make sure to know more about limitations on pet size and the number of pets. Furthermore, ask about any penalties if your pet violates one or some of the rules. Apart from pet-friendliness of the building, it’s also crucial to select an apartment that’s near your workplace. Contemplate on how easy it is for you to get home in a day. For example, if your dog got sick, can you quickly go to the property during your lunch hour to give your pet medicine? Is there someone you can ask in the building to look after your pet when you’re gone? Another thing to consider is the amount of space that you need for your things and your pet. Don’t just think about now but also the future. If your dog is an energetic, playful type, then it requires a spacious living area. You should also opt for an apartment that’s near a dog park. Now, if your dog is large and the apartment is on the fifth floor, it might have a problem going up. Worse, it might develop joint issues as it grows old. If that would happen, it could not manage to go down on its own. Thus, choose to live on the first or second floor. Apart from the convenience, living on the first floor will help you save the hassle of taking your pet up and down when it needs to have a bathroom break. It’s also beneficial if your dog is heavy. Keep in mind that if your pet weighs more, it makes a lot of thudding sound around your apartment. If you live on the first floor, you don’t need to worry about the neighbors below you. You must also avoid an apartment with carpeted floor. It’s not only to make it easier for you to clean the property but your landlord won’t ask a high amount of security deposit. If you haven’t found that perfect apartment yet, try looking into a single-family rental. Most large flats have breed and size limitations on their pet policies. However, individually-owned properties are typically flexible. They allow large dog breeds. Even though it’s on a case-by-case basis, they might still let you bring your pet. Although you want to take care of a pit bull and other aggressive pets, it would be helpful if you own a pet that’s non-aggressive. Choose a dog or a cat that won’t pose a threat to the neighborhood. Most landlords don’t accept German shepherds, Great Danes, and Siberian Huskies. If you have a chowchow or a chihuahua, then your potential landlords might allow you to rent. If you’re relocating for your job, the best cities where you can easily find pet-friendly apartments would include Portland, Oregon, San Diego, and Chicago. 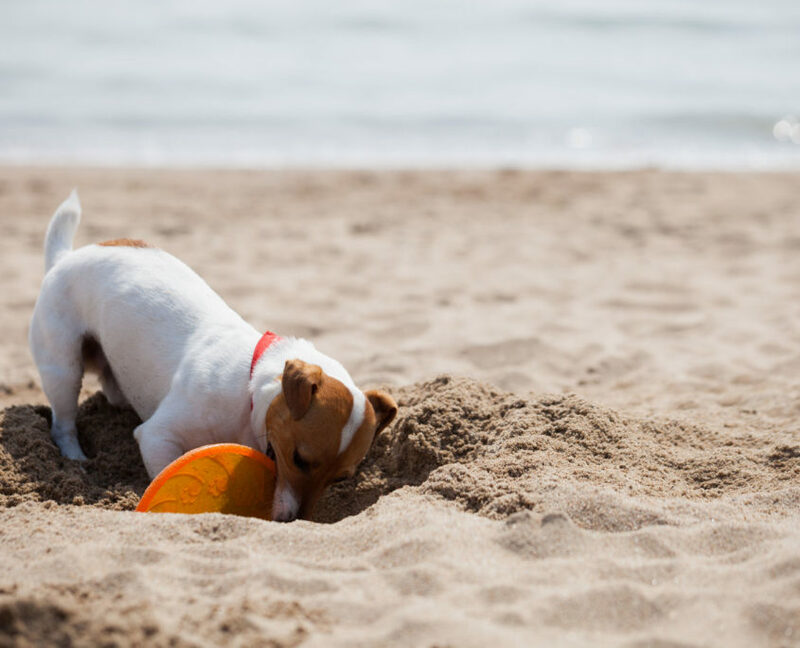 Apart from quickly finding these apartments, there are also plenty of dog parks and hangout spots that are pet-friendly. Another thing to consider is to train your dog or cat. It’s true that training can be expensive. However, it becomes cheaper considering the cost you need to pay when your pet destroys the door frame, furniture or carpet. Furthermore, having a trained pet will assure you that it won’t be a problem for the landlord. Regardless of your apartment’s location, always communicate with your landlord about your pet to help improve the safety of your pet and the other tenants. Catrin Cooper works at Rentberry, a platform that helps connect renters with landlords. Like humans, dogs too inherit more than intelligence and good looks from their parent and ancestors. They inherit behavioral tendencies, and other physical symptoms as well. Physical disorders and limitations are genetic as well. Environmental factors determine how both genetic potential and genetic limitations surface as well. Nutrition and a healthy lifestyle are as much needed for your pooch as it does for us humans. The genetic background of your canine friend holds the key to identifying the inherent risk of breed specific health issues. These issues are not linked to any pure breed alone but also surface in multiple/mixed breeds which share similar conformations and statures. 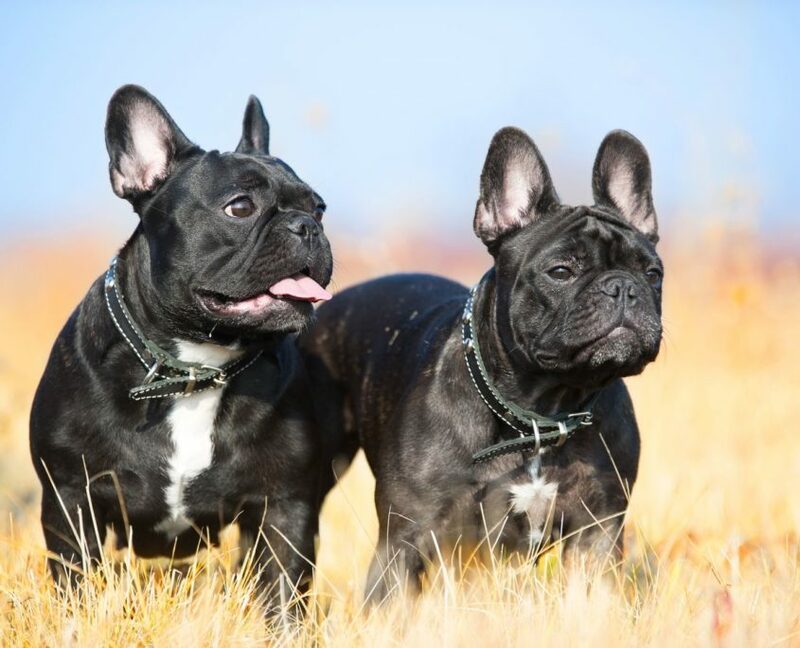 There are a few breeds which are naturally healthier, some which are prone to specific types of health issues and so on. 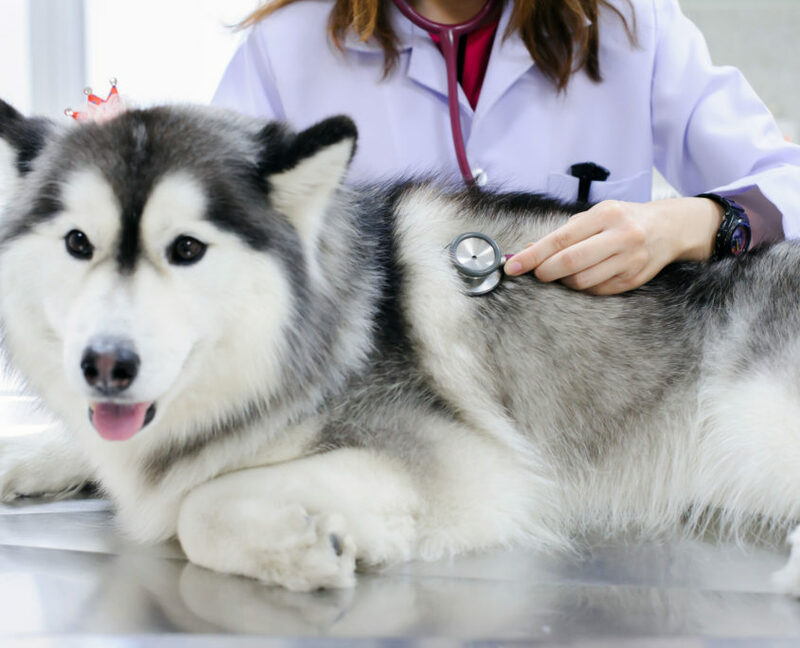 Given below are 3 common genetic health disorders that are commonly found in dogs, along with the type of breeds that are generally prone to these disorders and their treatment. Symptoms: The symptoms include a difficulty in rising, lying down, climbing up and down, jumping and a general hesitation to walk or run. Treatment: The line of treatment and therapy is recommended based on the severity of the condition. Usually, pain medications, physiotherapy or cold laser treatments are suggested. For the more severe cases, a surgical intervention where there is a complete hip replacement is also possible. It is important to maintain the ideal weight of the dog to reduce the intensity of hip dysplasia. This is a neurological disorder which affects dogs in the form of seizures. It can be very distressful for the dog as well as the pet parent. Sudden, recurring, and uncontrolled seizures typically characterize this disorder and occurs for unknown and known reasons. 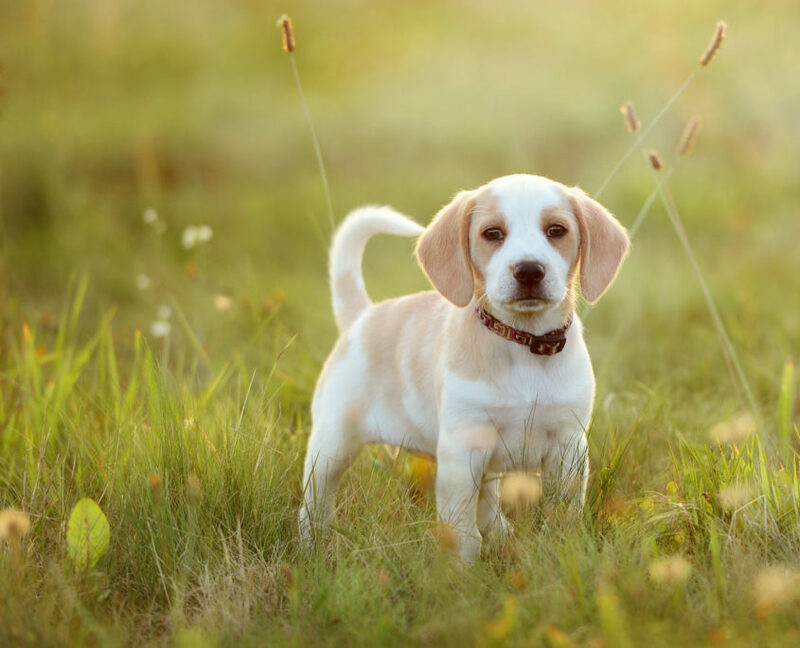 Some of the breeds that seem to be genetically prone to epilepsy are Beagles, Retrievers, Dachshunds, Keeshonds, Labradors, German Shepherds etc. 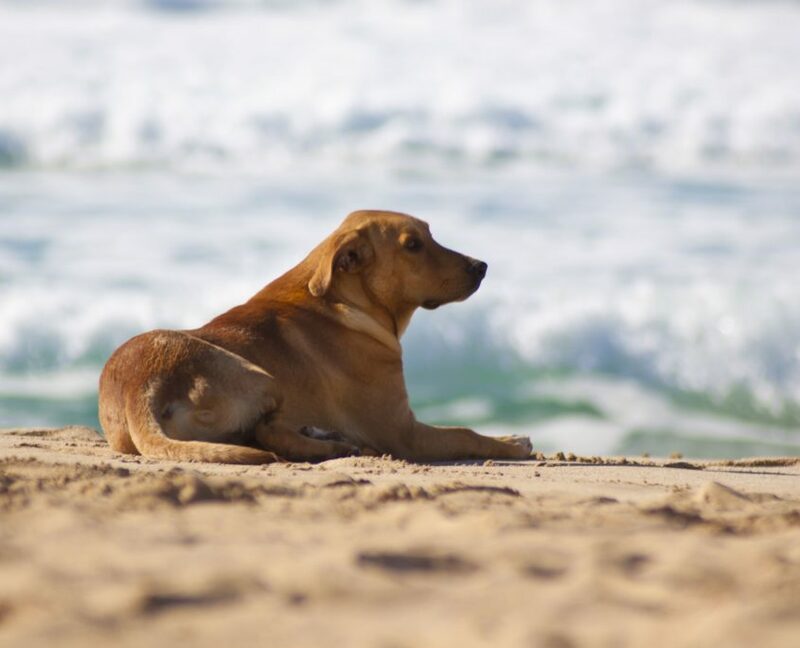 Symptoms: A seizure causes the dog’s body to stiffen and fall, paddle their fours, salivate excessively and at times lose control of the bowel and bladder. Treatment: Though this condition is not completely curable, medications are available to control the recurrence of seizures and efficiently reduce their frequency and intensity. Cardiovascular problems are not exclusive to humans alone. Canines too suffer from cardiac issues and there are dog breeds which have inherited this disorder because of the defective genetic pool. 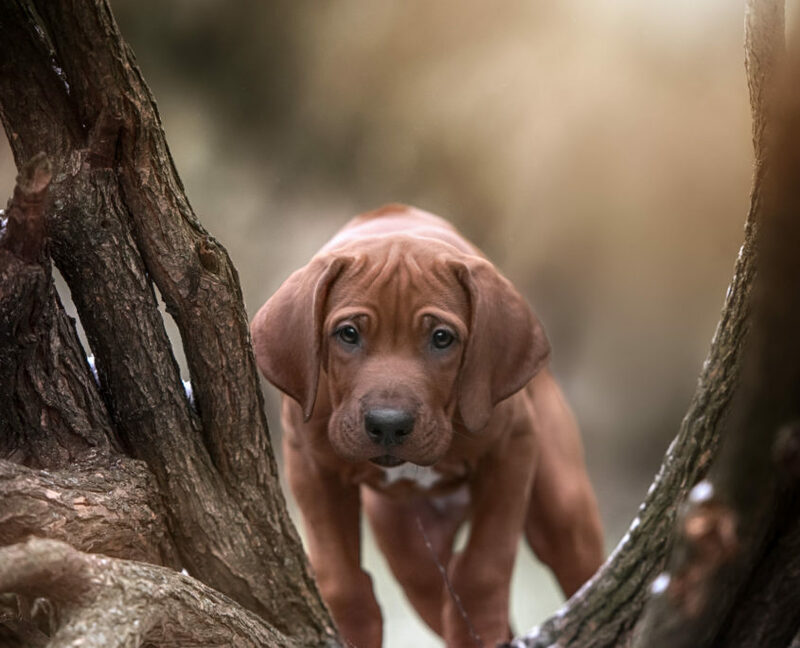 The breeds that studies identify as predisposed to genetic cardiovascular issues are Dobermans Pinschers, Boxers, and Great Dane. Symptoms: Recurring breathing difficulties with sudden collapsing, abdominal distention, recurring cough and general weakness. Treatment: Clinical treatment must be regularly undertaken and surgical intervention is done based on the severity of the issues. Most genetic conditions may not seem to have a permanent cure. 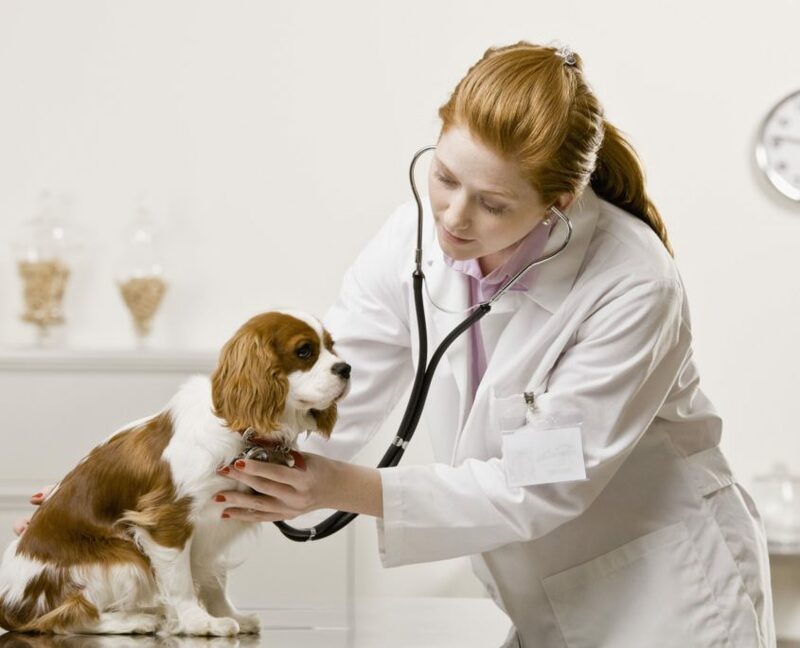 However, with the advancement of Dog DNA testing methods, such genetic health disorders can be identified early. As a result, preventive measures can be put in place early. For example, Hyperuricosuria (Urolithiasis) is a known genetic condition that affects 20 different dog breeds. Dogs breeds that are affected by this condition are more prone to develop bladder stones that could require extensive surgical procedures to remove them as they grow older. 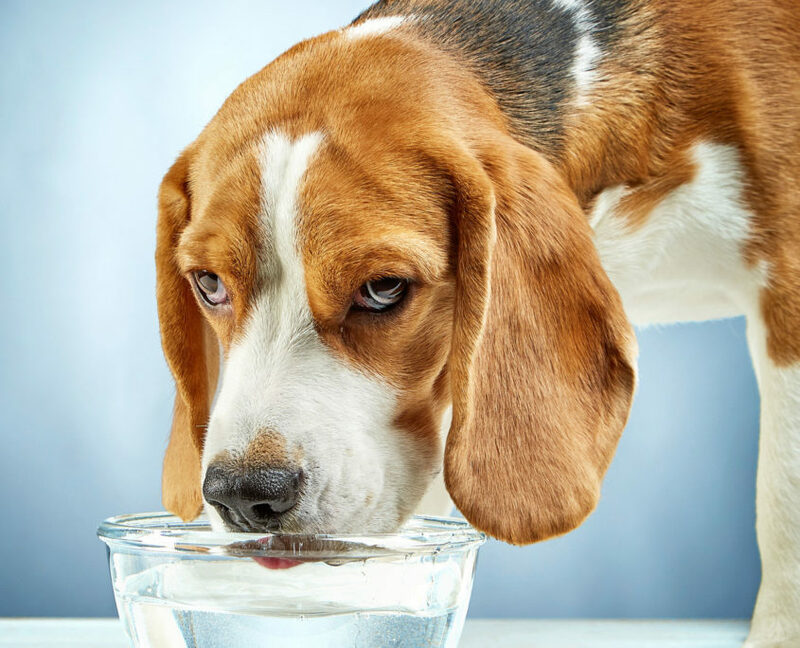 This condition could be mitigated from the start with dietary recommendations such as making your dog drink larger amounts of water daily and avoiding purine heavy foods. Responsible dog breeders and pet parents can identify the presence of genetic mutations and other risks through this method. Develops a better understanding of your dog’s behavioral patterns and personality traits. Helps prevent and mitigate the symptoms that are common to the genetic disorder and reduce the distress in affected dogs and thereby raise healthy, happy dogs. Planning suitable and nutritious foods in line with the vet’s advice. Raise healthier dogs by providing the right environment for your dogs to grow. Do you have a new furball in the house, or even just thinking about getting one? If this is your first pet, there’s a lot to learn and consider — even if you grew up with a cat or dog. In order to create a great initial experience and overall happy household for both you and a new four-legged friend, run through this list. Before you commit to being a parent to a new cat or dog, the most important thing is to understand what it is you’re getting into. If you do research, talk to multiple trusted sources, and find out about certain behavior or personality traits that you’re confident won’t jive well with your home, lifestyle, or family, it’s best to not take the gamble and bring the animal home (no matter how cute). There’s a right home for every pet, and taking the time and responsibility to find the one that’s right for you is an essential first step. This doesn’t just mean buying the necessary bed, toys, accessories, litter box, food, and anything else you may need (though you should definitely have these on hand right away). It means you should plan out a routine and contingency plans. If you think you’ll need extra help training a new puppy, look into private trainers or puppy training schools. You’ll also want to make sure you’re aware of potential boarding options for daycare or weekend sitting. While you’ll want to spend all your time with your new little love, it’s equally important to source out other care resources for those times when you need some extra help. 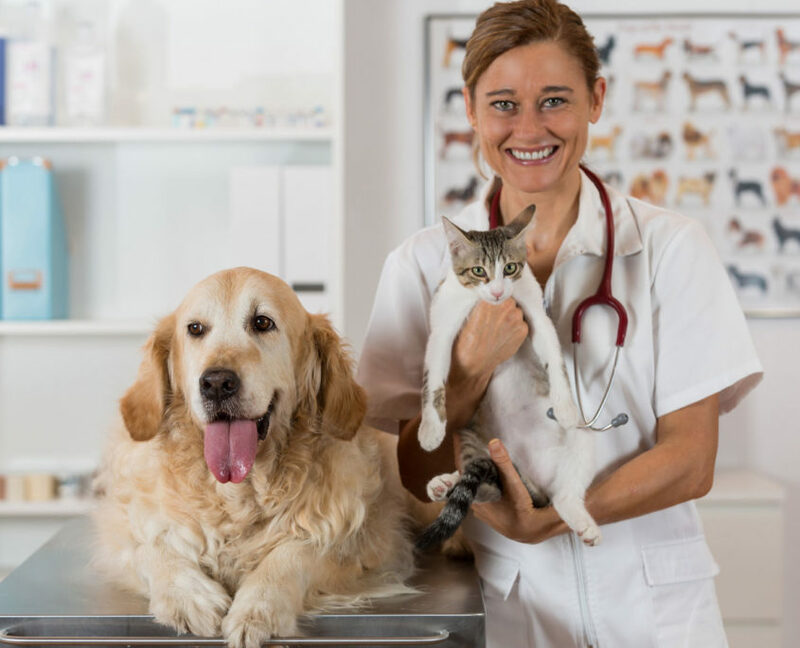 One of the very first things you’ll do with your new pet, whether they’re a puppy/kitten or an adopted older animal, is take them to the vet to make sure they get all the shots they need and are in overall good health. When you’ve found a reliable vet, keep their contact information readily available — in your phone, on your fridge, in your wallet — because you never know when and where you’ll need it. Accidents will happen. Training difficulties will happen. That doesn’t mean that you’re not going to be a great pet parent, and have a happy household with your new four-legged plus-one. Getting the dynamic down will take a little time, but it’s well worth it. Written by Casey Dickson, Rover.com community member. Rover is the nation’s largest network of 5-star pet sitters and dog walkers. Fleas and ticks are relentless; they’re easy to prevent but a huge pain to control. 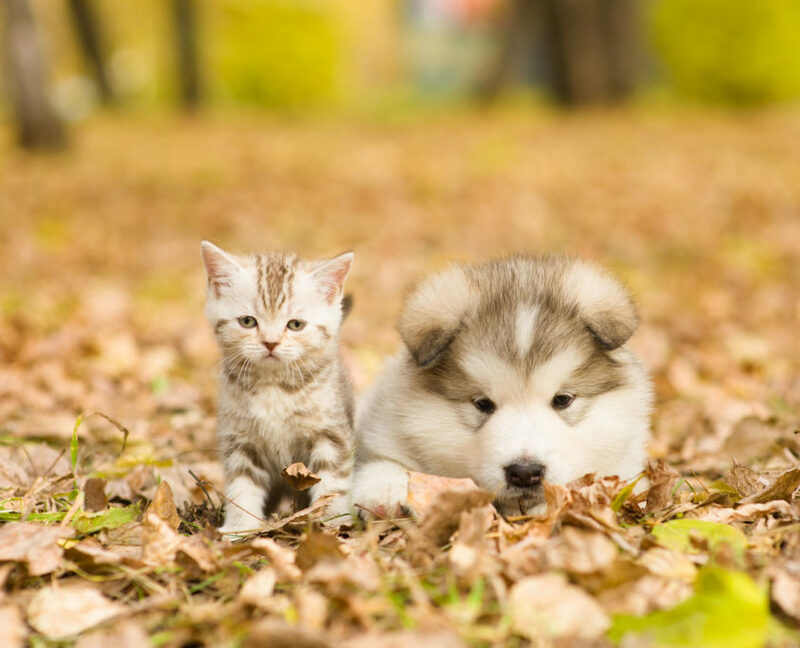 Keep your felines safe from biting bugs with the 5 most popular flea and tick treatments! You’ll never have to struggle with an infestation again! This spot on treatment is fast-acting, long-lasting and waterproof. Protect your kitties for up to 1 month! In addition to killing 98-100% of adult fleas on your cat within 24 hours, Frontline Plus contains a special ingredient that also kills flea eggs and larvae to break the flea life cycle for good. The new triple-action formula of Frontline uses 3 secret weapons to effectively kill fleas and ticks. It’s no surprise that Frontline is among the highest rated flea and tick medicine. This easy to apply, topical flea treatment is specially formulated for felines to help keep them protected from biting fleas for up to 30 days with a single application. Tired of reapplying topicals each month? Seresto® has you covered. This innovative collar provides effective protection from fleas and ticks for 8 continuous months! 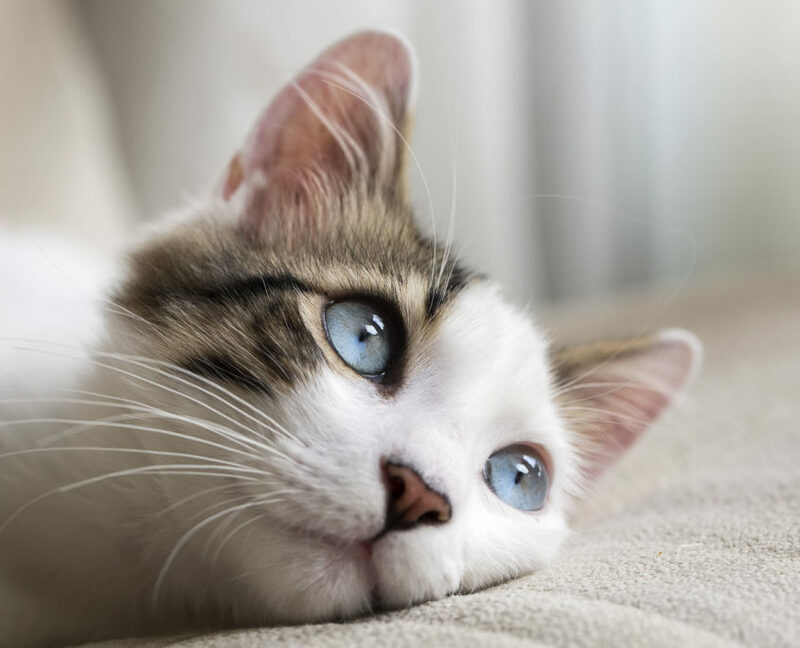 Is your cat always scratching the furniture? I know it can get frustrating, particularly as it ruins your home’s clean look! So instead of fretting and getting mad at your cat, it’s time to find alternative methods to get him or her to stop scratching the furniture again. 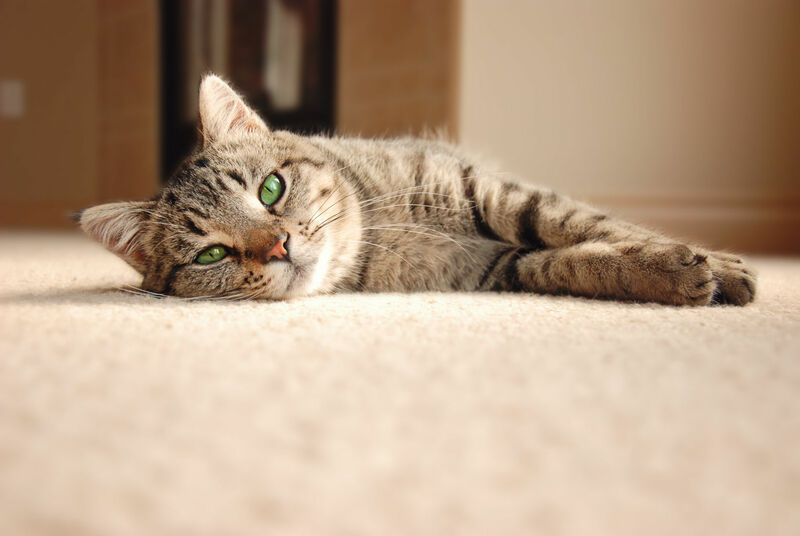 So here are 6 ways to prevent your cat from scratching your furniture! I recommend you to invest in a cat tree or scratching post, which will help prevent your cat from scratching other things. Plus, it keeps them entertained. Place it near areas where he is most likely to scratch. These are great investments, as these are more entertaining and proven to be beneficial for cats, especially since it comes with its scratching post. Other products you can invest in would be a scratch spray, which helps deter cats from furniture they’d like to scratch. 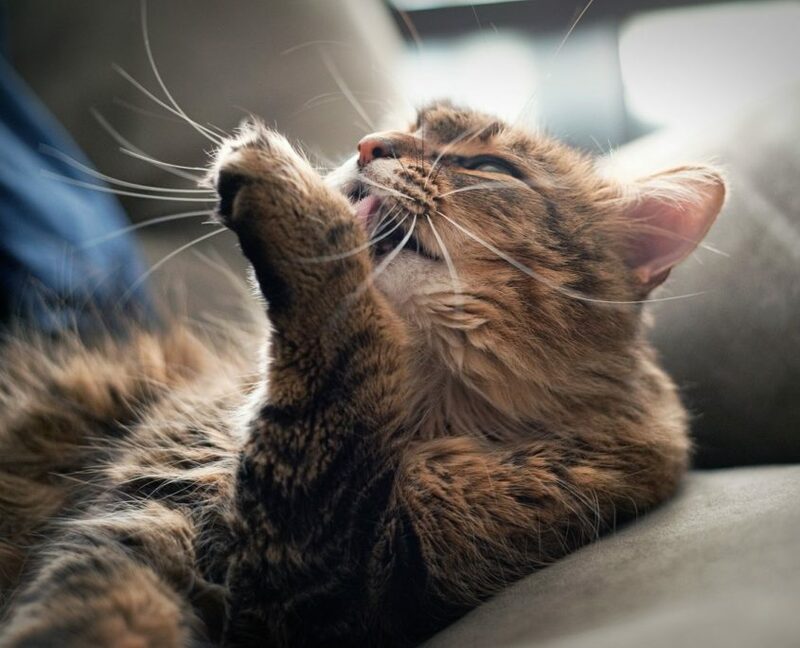 Have your cat groomed or trim his nails properly to prevent the blow of his or her scratching. Trim your cat’s nails at least once every few days. Avoid cutting it too short, because they need it as well! Another method to help lessen the scratches on your furniture would be to use plastic caps on your cat’s nails, which helps prevent your cat from damaging surfaces around him or her. You will need to ask your veterinarian about it. Also, it lasts for about three to six weeks, so replacement is required if you would like to keep the soft caps method for the long term. Observe your cat and how he reacts to the soft tips, as he may feel uncomfortable with it at first. 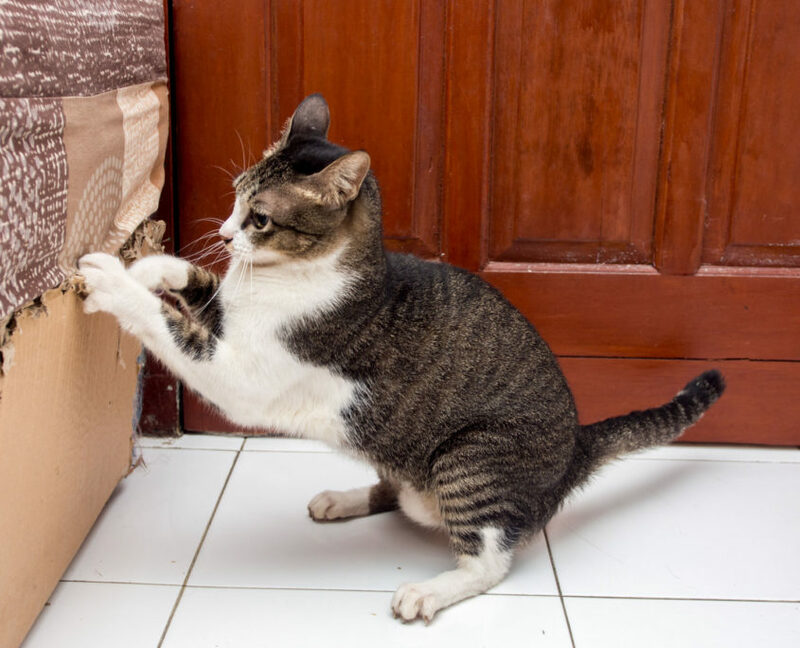 Your cat scratching furniture may be inevitable, but you can stop him from ruining your things by placing plastic, sandpaper, or double-sided tape on areas he seems to scratch the most. That way, your cat will not like the feeling and focus his attention on something else. You may also want to shut doors or install gates to prevent your cat from heading to rooms with expensive or new furniture. Use your voice and tone to correct your cat’s behavior. Catch your cat in the act and yell a sharp “NO,” which will reduce his interest in scratching it. You can also try dropping coins or pebbles that will startle your cat and discourage him from scratching. Keep a plastic spray bottle full of water and give your cat a small spritz when he or she is scratching somewhere they shouldn’t be. It will discourage them from scratching the furniture again. That being said, do NOT spray too much water on your pet as most cats truly do not like water. Spray just enough for your cat to know that what they did is bad. 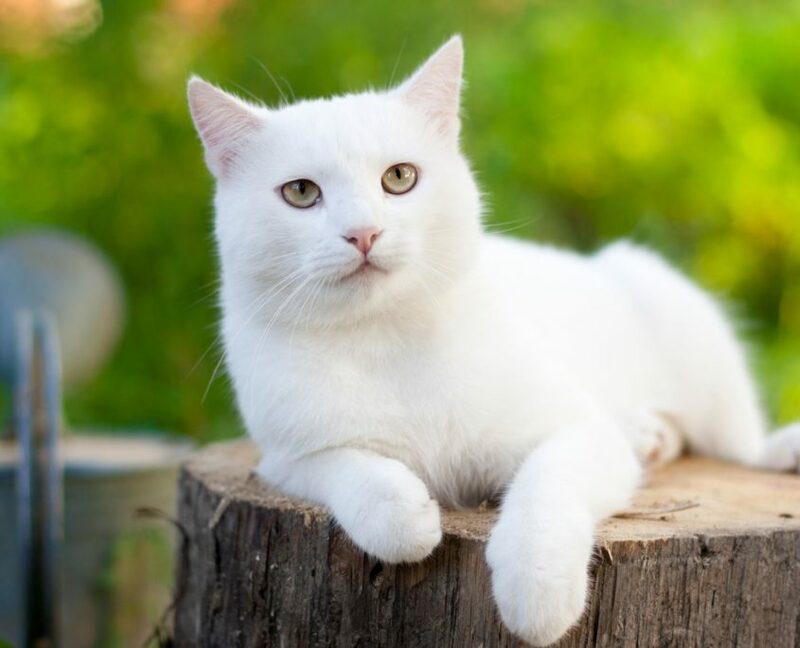 Cats need their outdoor time as well, where they can explore the garden and scratch the trees. Using nature as their scratching post will lessen their want to scratch furniture. Plus, exploring the outdoors may tire them out and will have them focused on resting once they’re back inside. 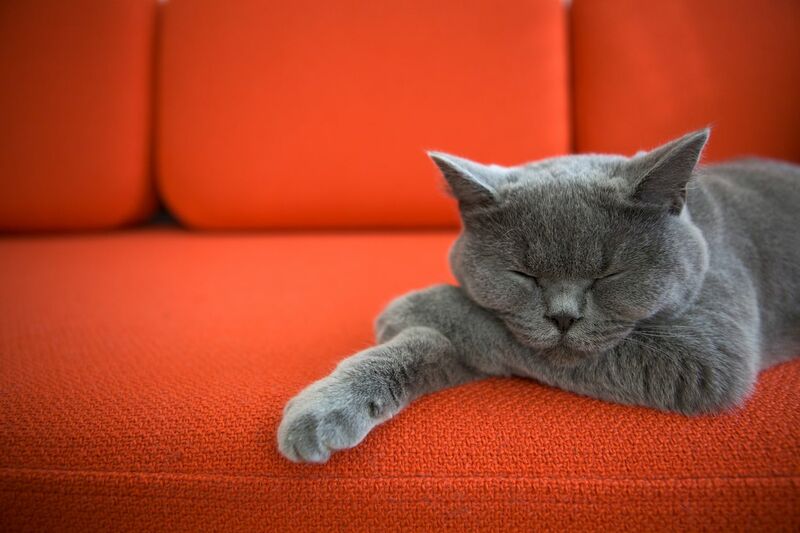 I hope that these 6 ways to prevent your cat from scratching the furniture helped you out! So don’t wait any longer and try any of these tips to preserve the state of your new furniture today. 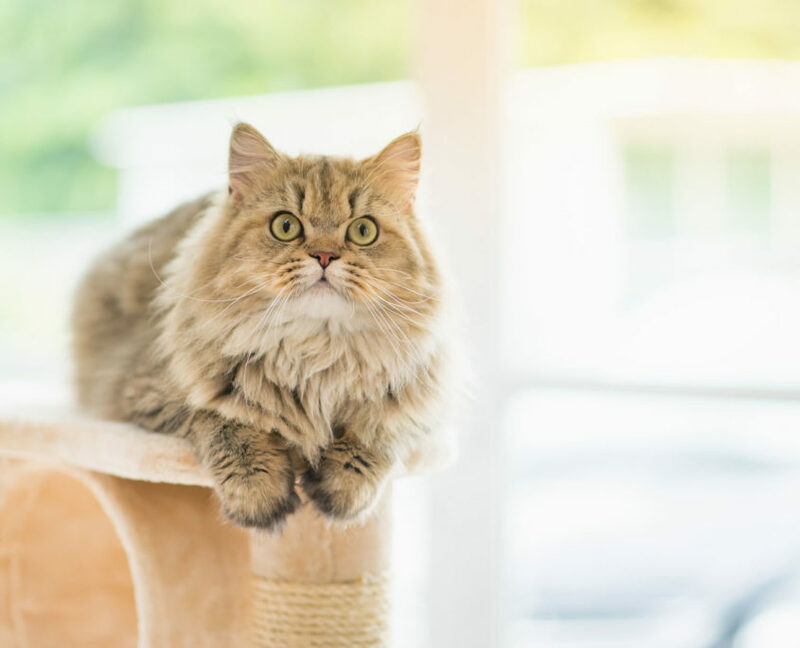 If you have any questions or would like to share your experiences on getting your cat to stop scratching around your house, then comment down below! I would love to hear what you have to think. Ella Woods is a mother, wife, and the author of Housinghere.com. She is 29 years old and loves writing about the personal experiences she goes through in her spare time! Comical, furry, and downright loveable – you have heard the saying dogs are man’s best friend right? Did you know that they are great for your kids too? My home would not be complete without the love of my canine companions. They have taught my children so many things about life and a dog would do the same for your children. 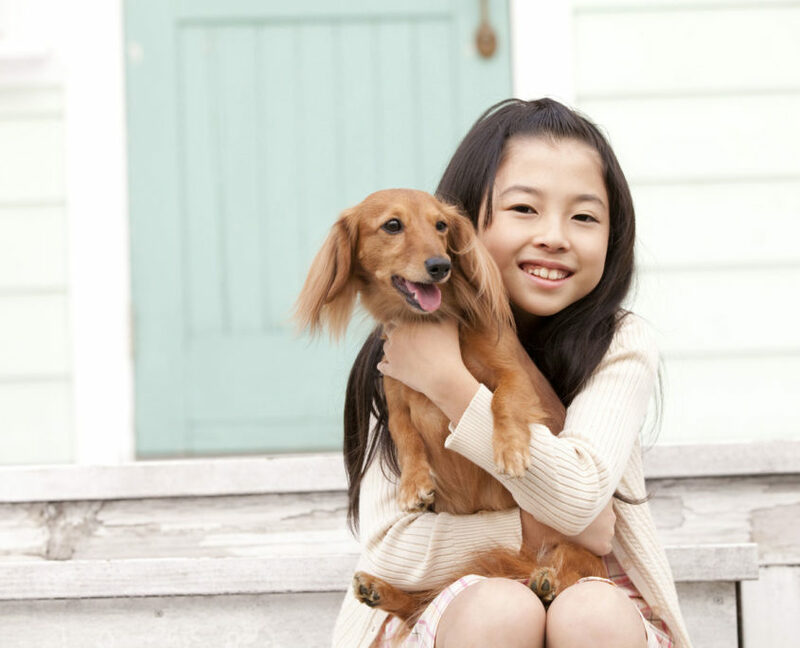 Ready to discover the wonderful reasons your kid needs a dog? Children struggle for acceptance among their peers at school. Everyone wants to be part of the “in-crowd.” They want to grow up quickly and be self-reliant, all the while worrying about how grades and behavior make them look. Having a dog to come home to will fill their life with unconditional love and support. The dog accepts them for who they are, no questions asked. Not to mention, by raising their puppy into an adult and training them on proper behavior, your child will feel such a sense of accomplishment and become more confident in everything they do. Eventually, our kids must learn to fend for themselves. While the thought of our babies leaving the nest gets most of us to tear up and have heart palpitations, we teach them responsibility so they will be ready for the world ahead. Having a dog is easily the best way to teach your kid the importance of being responsible. Beginning with the day you bring home your new pet, hand the reins over to your kids. Teach them how to properly feed and give water to their dog, how often to take them for a walk, training tricks, etc. You will see your child blossom as they take total responsibility for raising their new family member. It will also give them a new appreciation for time management and compromise, as they will need to get up earlier to take the dog out and discover that they may have to give up some social activities to put their pet first. Dogs need plenty of exercise throughout the day. Simply taking them for a potty time walk or letting them out into the back yard is not sufficient. Just like your child, they are full of energy that they need to get out. The great thing about dogs is their ability to play as long as your kid wants. They are thrilled to play tag, chase balls, or get down on the ground for some roughhousing. Your child will spend more time in the fresh air playing, and much less time sitting in front of a computer! 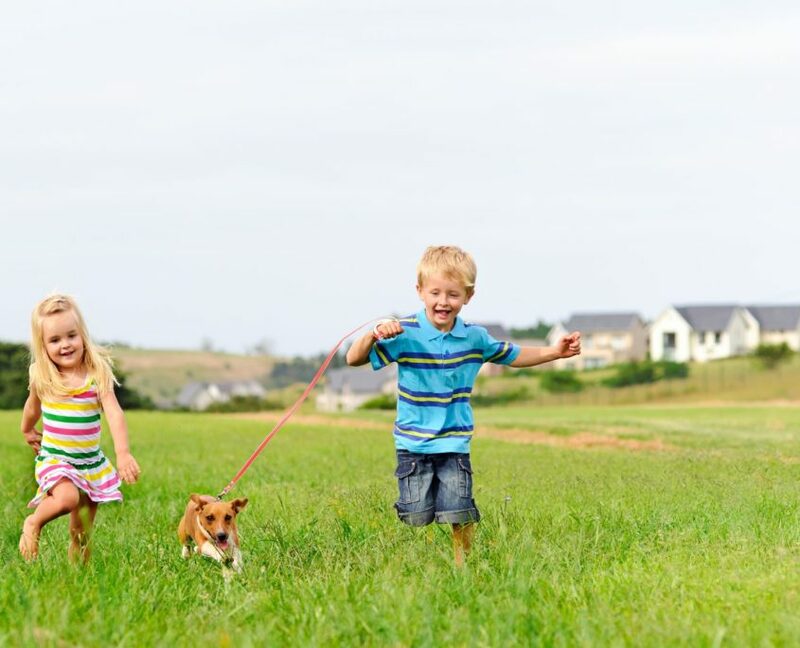 Did you know that having a dog keeps your kids healthy in other ways? 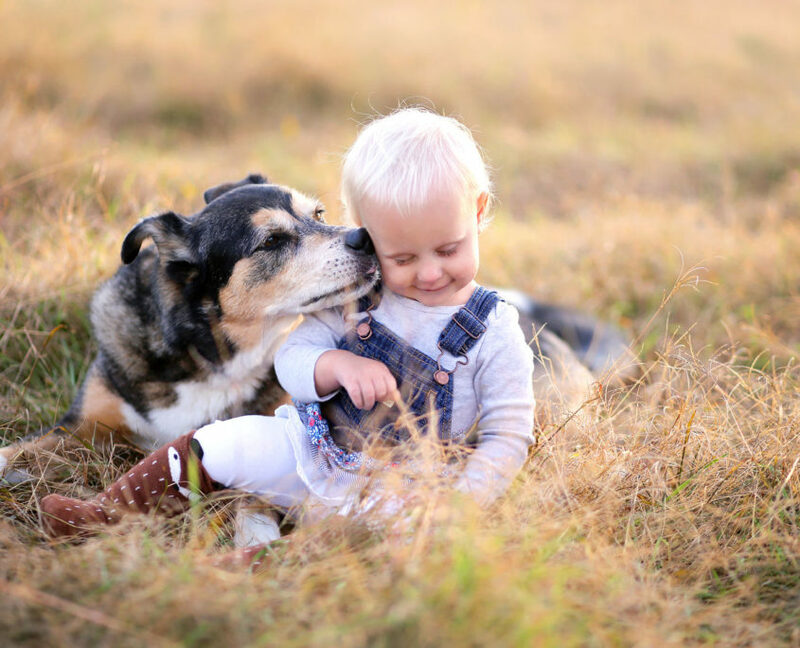 A study done in 2012, and published in the journal Pediatrics found that children who grow up with a dog have fewer ear infections and require fewer antibiotics. Reportedly, they were also healthy 73% of the time, compared to 65% for kids who did not have a dog. Additionally, a study completed in 2015 showed a direct link between kids having their own dog and better mental health. This may be one reason to get a dog that never crossed your mind. If you have two or more children they will surely all want to participate in raising the newest family member! Can you imagine your kids playing nicely together with the dog instead of fighting all the time? 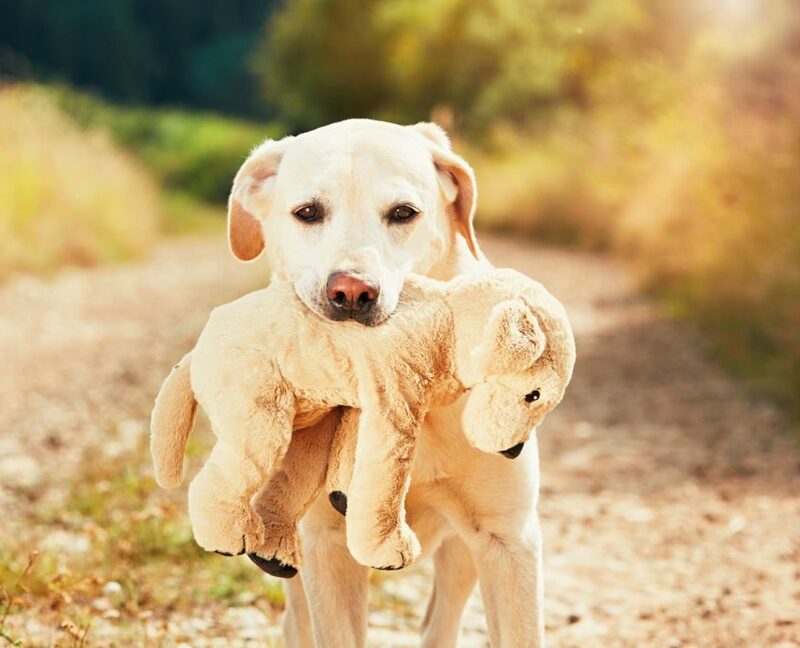 Your dog will certainly never be lacking for attention or companionship. They will bond together over their shared love of the pet and hopefully carry this new relationship dynamic for years to come. Each of your kids will still learn about responsibility without even noticing that they are actually becoming friends! We all know a dog can sniff out a thick steak at fifty paces. Their sense of smell is beyond incredible. In the same way, they find that scrap of broccoli which “fell” from your kid’s plate (be honest here…we all know they threw it on purpose! ), dogs have an uncanny ability to sense when there is something amiss with us. Have you ever cried only to feel a wet nose gently touch your hand? Remember when you had the flu and were bedridden for a week? I bet your dog never left your side. 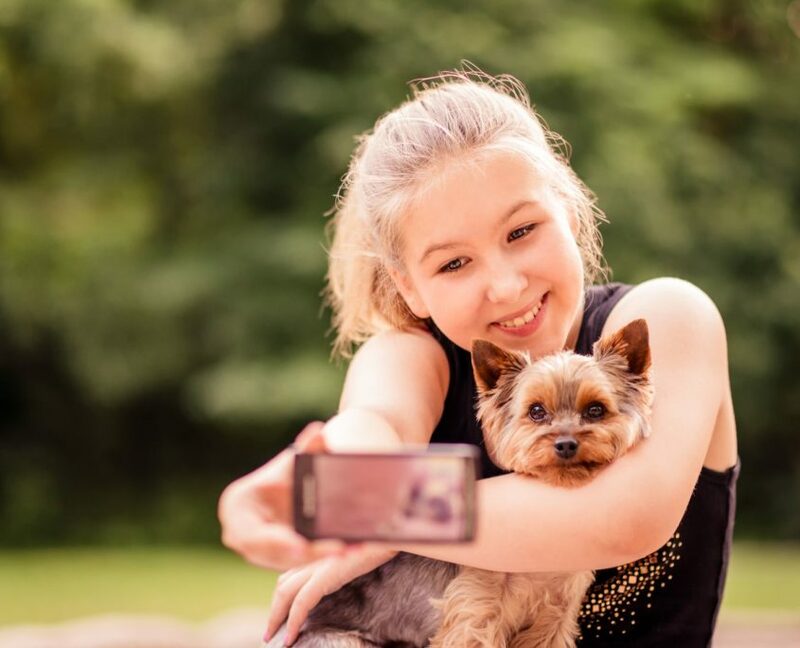 Dogs teach our kids to recognize how others are feeling and to give support when needed. 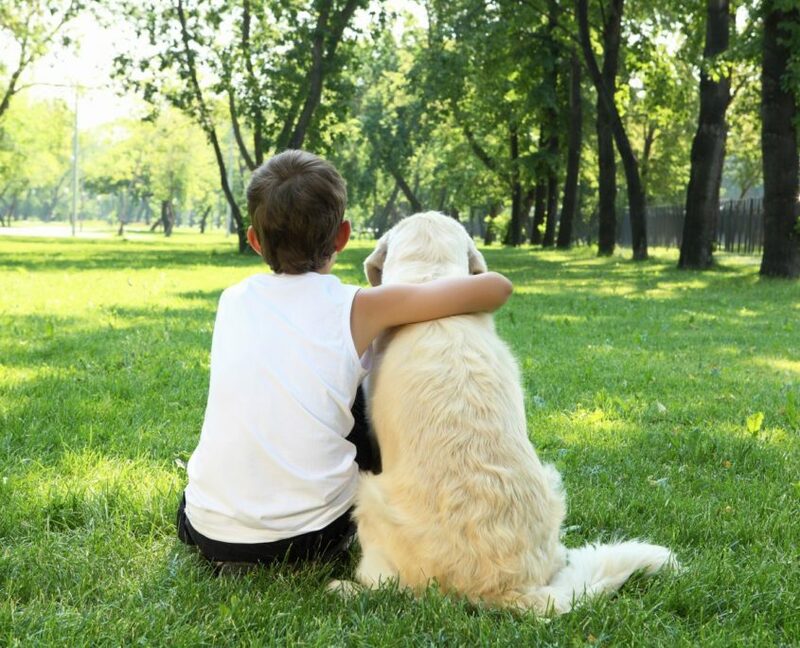 Compassion towards others will become second nature to a kid growing up with a dog. Everyone needs a friend to stave off the loneliness and have someone to talk to. Your child is no exception. In fact, it is extremely important for their personal and social development. Single child homes do not allow for the same type of healthy companionship found in multi-sibling families. Growing up with their own dog gives kids a best friend who is always there and willing to listen. They always have a playmate ready to go with just a whistle. Most importantly, children become more social around their pets and often lose any former shyness they had with people. Simply get them talking about their pet and watch them light up with delight! Today’s world is a dangerous place, especially for trusting kids. Dogs bond quickly with their families, making them the center of their universe. They would do anything for those they love. While this gives parents a sense of comfort, dogs can become too protective. My pit bull is the friendliest dog on the planet – until a stranger tries to get near my grandson. While he does not attack, the verbal warning is more than enough to turn most people away! To stop this from happening with your dog you and your child must start training him or her early. Your dog should be well socialized and know basic obedience commands. 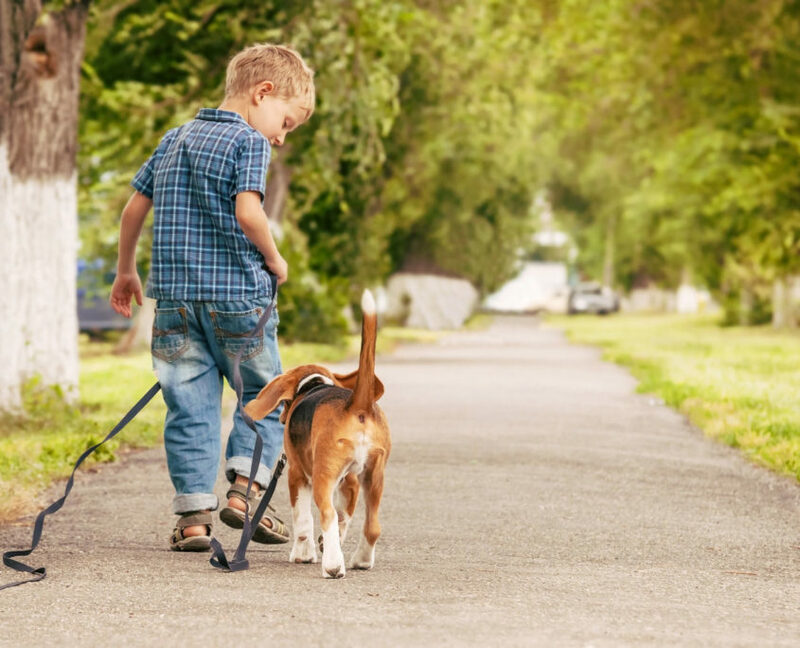 Training sessions are also a great way to keep your child engaged with the dog and feel a sense of accomplishment. Now you have 7 wonderful reasons to say yes when your kid asks for a dog! Was this article enjoyable for you to read? Please feel free to leave any comments you may have below on your own positive experiences raising your child with a dog. I have just one small favor to ask. Could you kindly share this post with all your family and friends to help them make the right choice for their kid too? Helena Foster is a Veterinary Nurse and the founder of PawsomeWorld. She has a lovely dog – Lulu. With the love for dogs, she’s willing to share her experiences for dog owners to help them make a better life for their own dogs. If you’re a dog owner, it’s likely you’re familiar with ticks. While ticks may seem like a minor annoyance, they can infect dogs and humans with harmful, even life-threatening diseases. With ticks present in every state throughout the summer months, it’s important to be aware of the diseases they can cause and how to respond to them. Here are a few of the most common diseases spread by ticks that could affect you and your dog as well as strategies for prevention. Lyme disease is one of the most common diseases that can be spread between dogs and people. While it is not typical for a person to become infected through direct contact with their dog, it’s common for dogs to carry infected ticks into the house or other shared spaces where people and other animals could contract the disease. 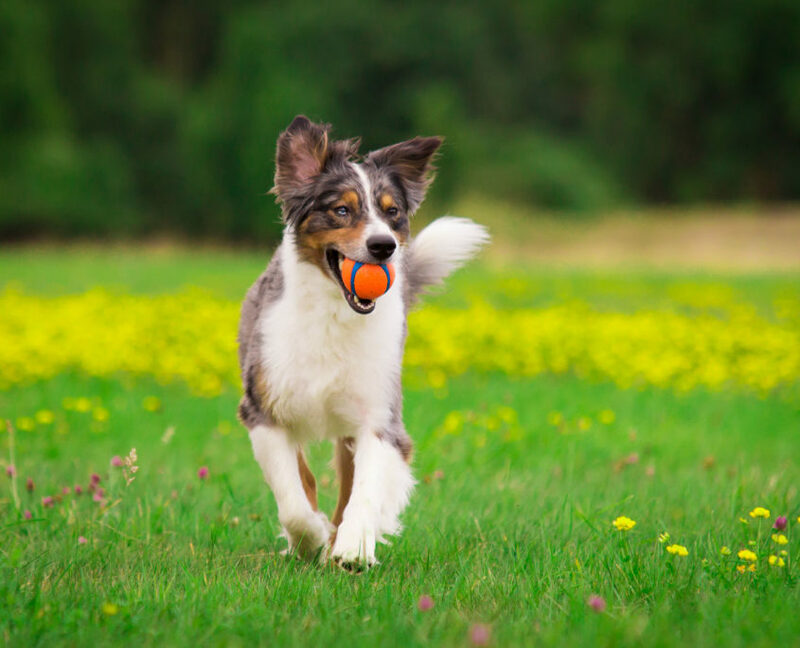 The most obvious sign of Lyme disease in dogs is lameness, though other symptoms include lack of appetite, irritability, depression, and fever. In humans, Lyme disease presents flu-like symptoms including fever, chills, sweating, fatigue, nausea, and muscle and joint pain. People with Lyme disease may experience a rash that forms as a red ring around the bite and can expand up to twelve inches. 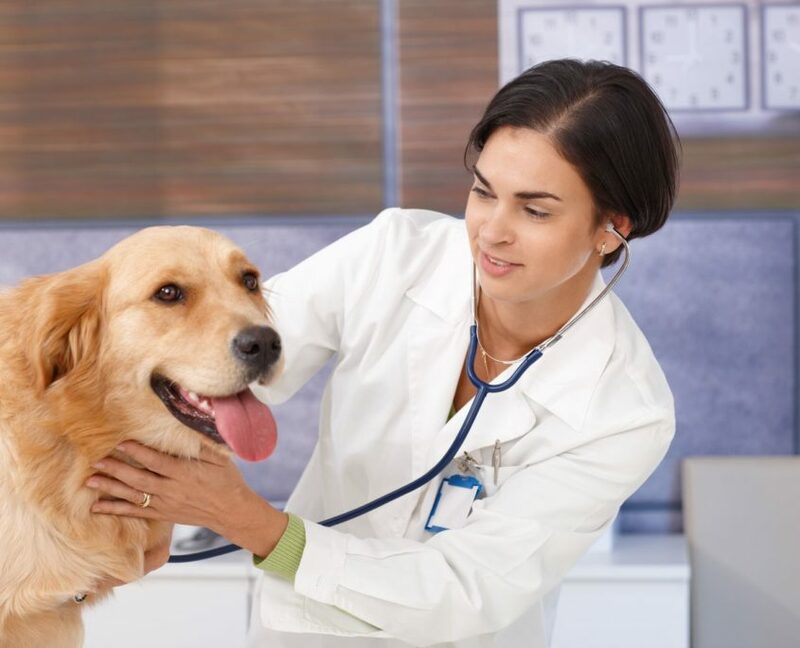 In dogs and humans, Lyme disease is usually treated with a four-week course of antibiotics, though some symptoms may remain after the infection has been eliminated. 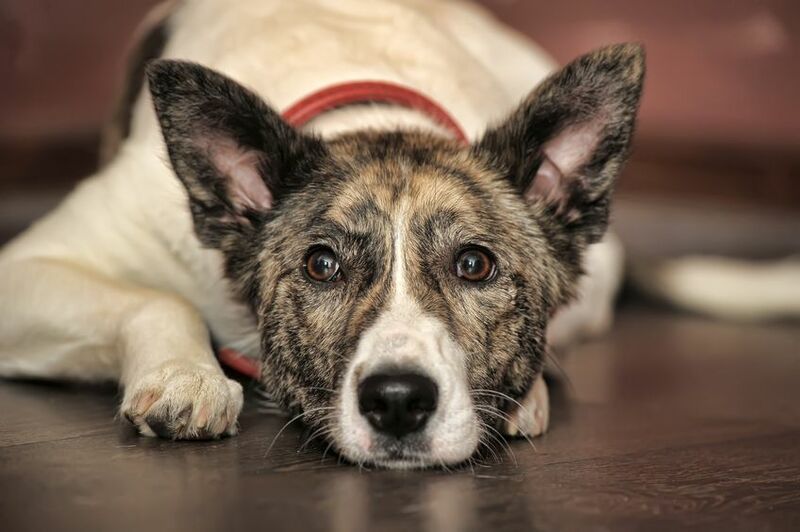 Dogs may experience a relapse, and the lingering infection may lead to kidney disease. Babesiosis is caused by many species of microscopic parasites that infect red blood cells. As with Lyme disease, babesiosis causes flu-like symptoms in humans, though many people who are infected with babesiosis don’t show any symptoms and feel fine. 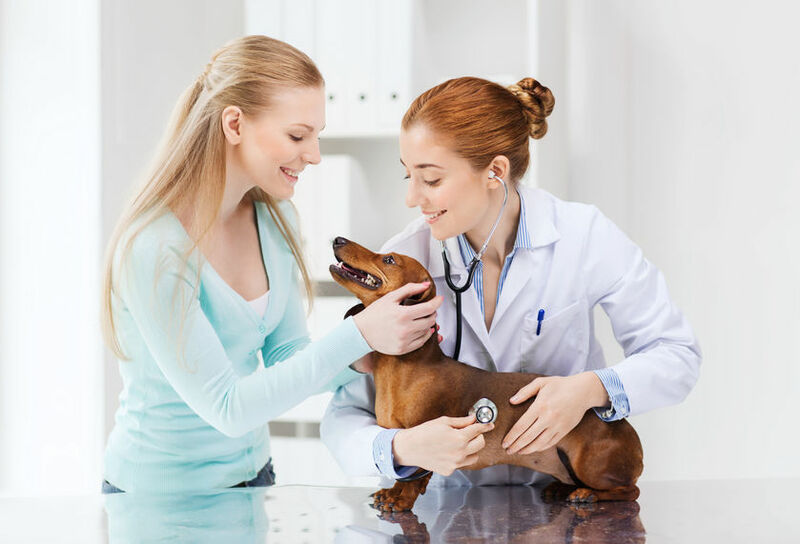 However, in dogs, this infection causes anemia, dark urine, fever, swollen lymph nodes, general weakness, and in some cases a dog could suddenly collapse and go into shock. Though Babesiosis is treatable, it is likely to remain in a dog’s bloodstream even after symptoms have dissipated. This creates the risk of a relapse or spreading the disease to other dogs or humans. In humans, anaplasmosis causes fever, chills, headache, muscle pain, vomiting, diarrhea, abdominal pain, and weight loss. Dogs experience lameness, fever, joint pain, lethargy, and a lack of appetite with the possibility of seizures. It is also possible to contract anaplasmosis at the same time as Lyme disease. Ehrlichiosis is caused by bacteria that infect and destroy white blood cells. In dogs, this infection may cause weakness, lack of appetite, difficulty breathing, anemia, and fluid build up in the limbs. Because ehrlichiosis affects the blood cells responsible for clotting, dogs may experience hemorrhaging. In humans, ehrlichiosis causes fever, headache, fatigue, muscle aches, and a rash that makes the skin appear sunburned. The major symptoms in dogs are depression, anorexia, blood in the urine, an inability to walk normally, sudden bleeding, and inflammation. In severe cases, Rocky Mountain Spotted Fever can lead to irregular heartbeats, seizures, and kidney failure which can lead to death. Purebred dogs and German Shepherds are the most likely to develop a severe reaction to this disease. 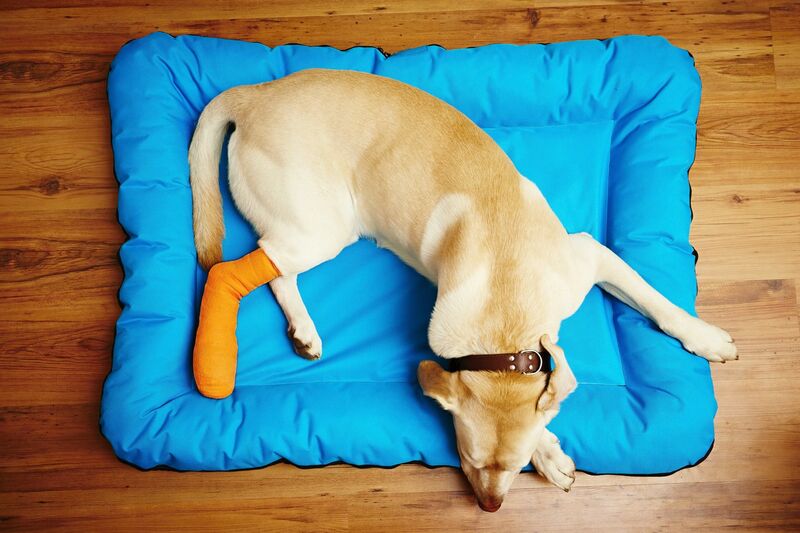 If treated within the first few days, most dogs will make a full recovery. However, dogs who experience severe damage to their nervous system may not recover completely. In humans, Rocky Mountain Spotted Fever causes fever, headache, vomiting, stomach pain, muscle aches, lack of appetite, and a characteristic rash that covers the skin in red splotches or pinpoint dots. In severe cases, some patients may be left with permanent damage to blood vessels, resulting in the amputation of legs, arms, fingers, or toes. Other potential long-term effects include paralysis, hearing loss, or mental disability. Among tick-borne illnesses, tick paralysis is the only condition that is not caused by an infectious organism. Instead, it is caused by a neurotoxin in a tick’s saliva. 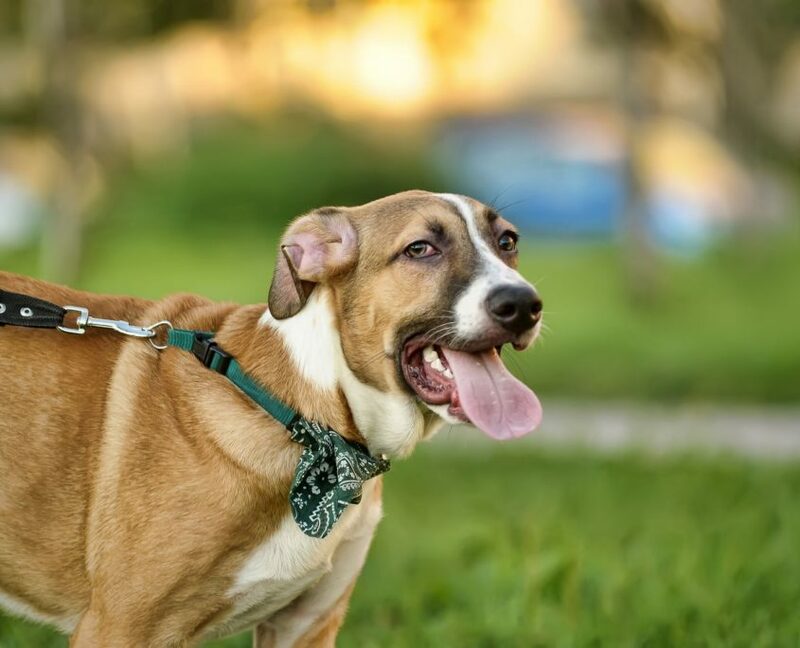 Initial signs of tick paralysis in dogs may include a change in the dog’s bark, labored breathing, coughing, excessive drooling, vomiting, and weakness in the hind legs, which leads to paralysis throughout the dog’s body. Cases of tick paralysis in humans most commonly occur in children and cause muscle pain, restlessness, fatigue, weakness, and a “pins and needles” sensation. Eventually, this progresses into paralysis of the lower extremities and spreads up the body, potentially leading to respiratory failure and death. 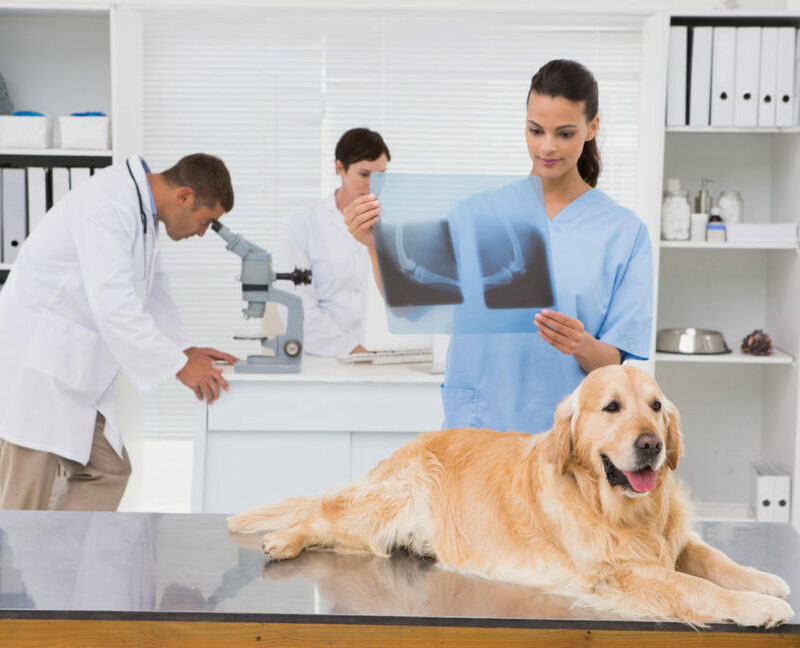 Dogs and people typically have difficulty swallowing and should be monitored closely. If they seem to be struggling to swallow, it may be best to avoid eating and drinking until the symptoms subside in order to avoid a serious form of pneumonia caused by inhaling saliva, food, or water. The most important step in treatment is to find and remove the tick. In some cases, this can relieve symptoms within hours or days. At this point, humans will usually recover on their own, though you should take a dog to the vet in order to determine if an anti-toxin is necessary. 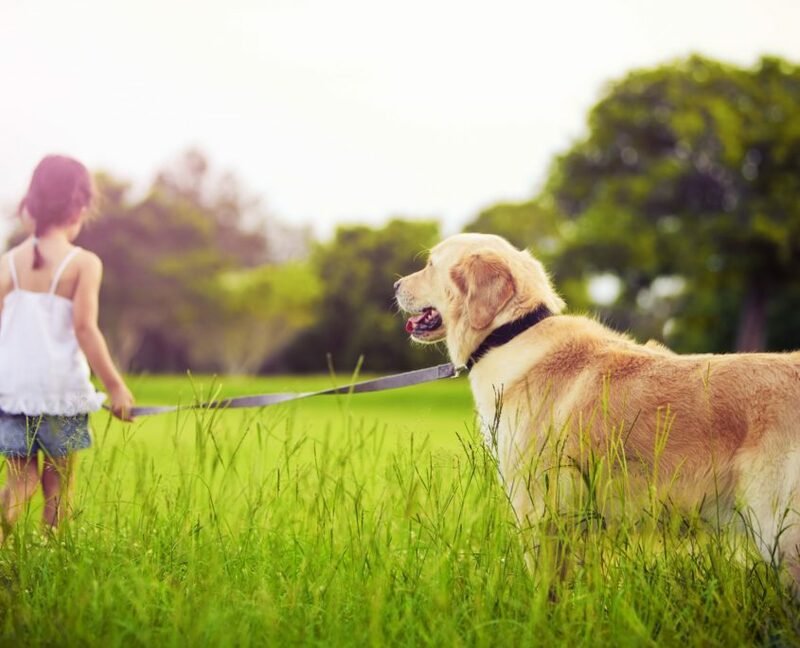 The best strategy for preventing tick-borne illnesses is to carefully check your dog and yourself for ticks on a regular basis, especially after any extensive outdoor activity — though brief ventures into overgrown areas or even trimmed lawns can result in a tick infestation as well. The ticks that spread Lyme disease typically need to be attached for at least two days in order to infect a dog. In this case, an infection is entirely preventable as long as you check your dog regularly. In order to check for ticks, brush your fingers through the dog’s fur with enough pressure to feel any small bumps. Be sure to check in less obvious areas such as between the dog’s toes, under their armpits, around their mouth, and behind their ears. If you feel a bump, pull the fur apart and confirm that it is a tick. Ticks may be the size of a pinhead, though if they have been attached for long they may be as big as a grape. Using tweezers or gloved fingers, grab the tick as close to the dog’s body as possible and pull the tick out with a steady motion. After removing the tick, clean the site of the tick bite with soap and water and place the tick in isopropyl alcohol. You’ll also want to disinfect the tweezers you’ve used in order to prevent infection. Even if you believe you’ve removed the tick early enough, it’s important to watch for signs of tick-borne illness as well as infection around the bite area. 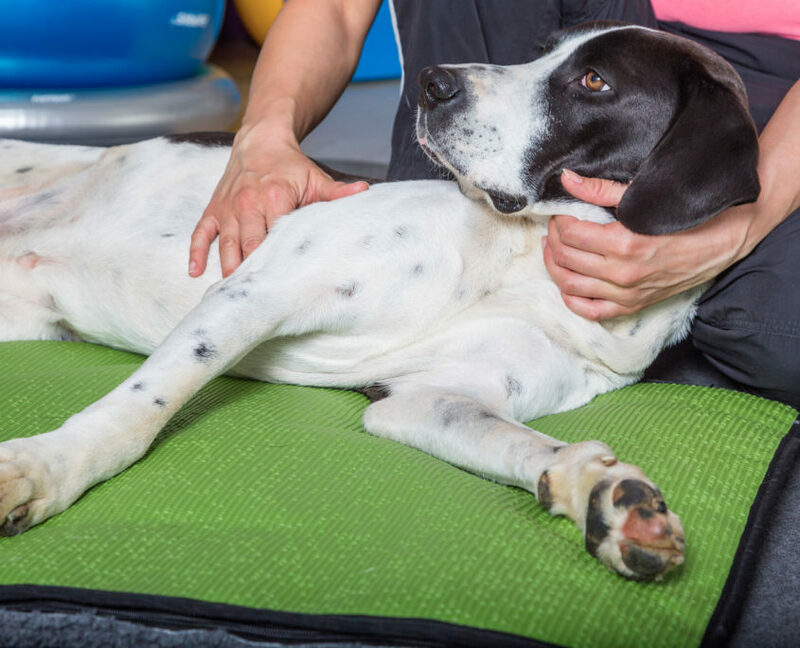 Paying close attention to any deviation from your dog’s normal body language could make a huge difference in the speed of treatment and recovery. 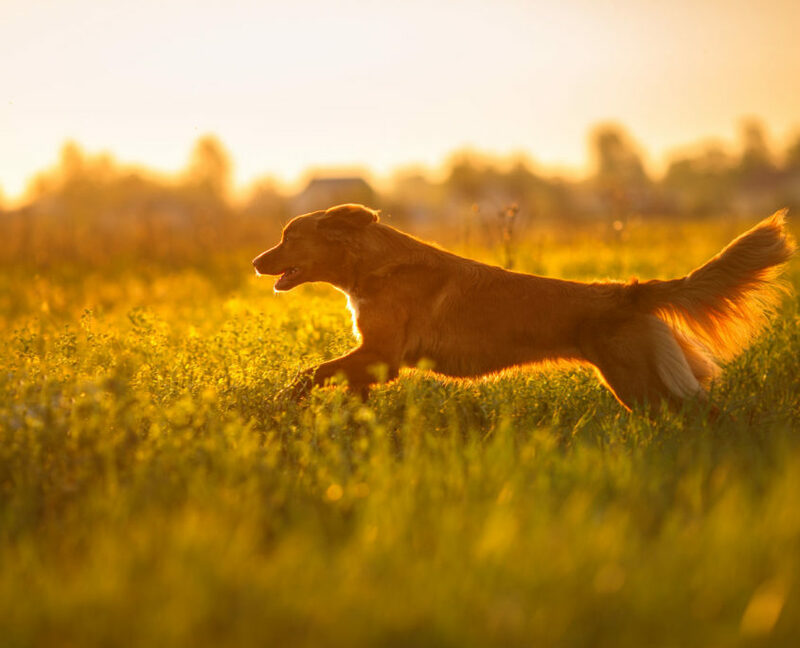 With a variety of tick control products available, it’s possible to prevent ticks from biting your dog in the first place. These include collars, topical treatments, and medications, though you should be careful to use the correct dosage for your dog and avoid mixing different tick control products. Depending on the regulations in your area, you might also apply pesticides to your lawn in order to decrease your risk for infection. If you or your dog develop any symptoms of a tick-borne disease, it’s important to seek proper treatment as soon as possible. While the immediate effects of these diseases can be unpleasant, the long-term effects can be devastating and irreparable. If in doubt, it’s always best to reach out to your vet or doctor. When the weather decides to kick it up a notch and the warmer temperatures arrive it can be a bit uncomfortable for your pet. The summer is typically the time when the families prefer to enjoy time outdoors. 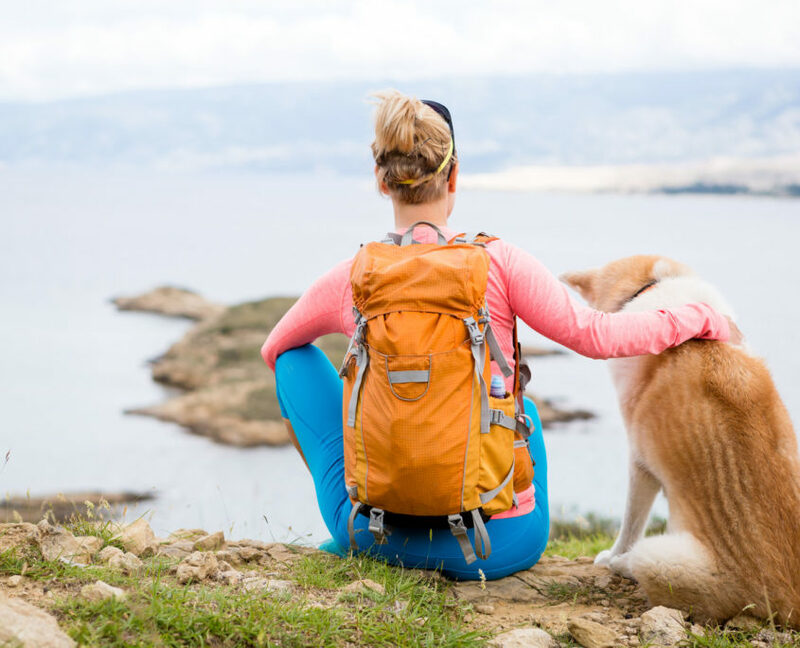 If you are enjoying the time with your family members in swimming or some hiking, there are chances that the furry family members will also participate along with you. 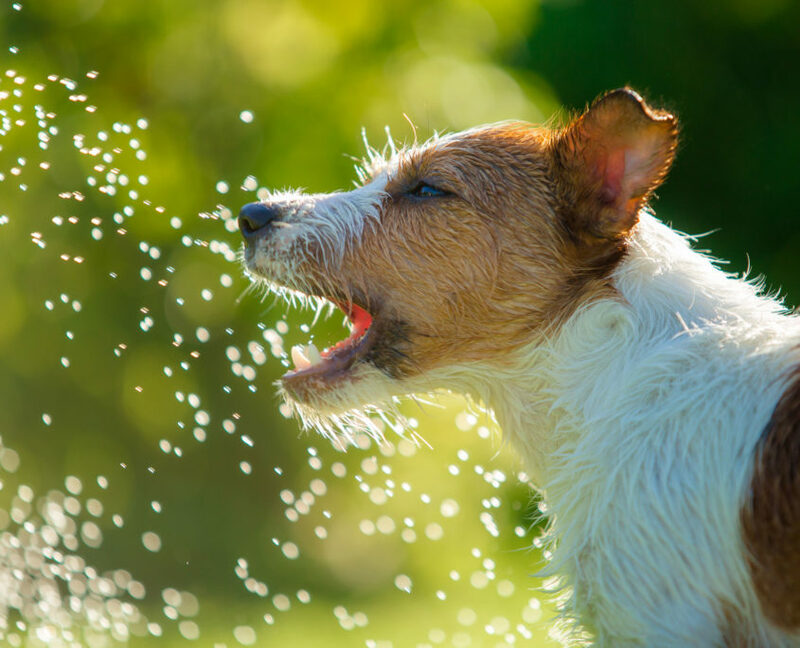 Most of us would be aware of the fact that it is important for human to stay hydrated but it is equally important for your pets to stay hydrated. Here are a few tips! If your pet isn’t getting the right amount of water they need they could suffer from heat exhaustion, stroke, or even death. Some common symptoms like increased heart rates and respiratory rates, drooling, excessive panting or mild weakness must be taken care of. 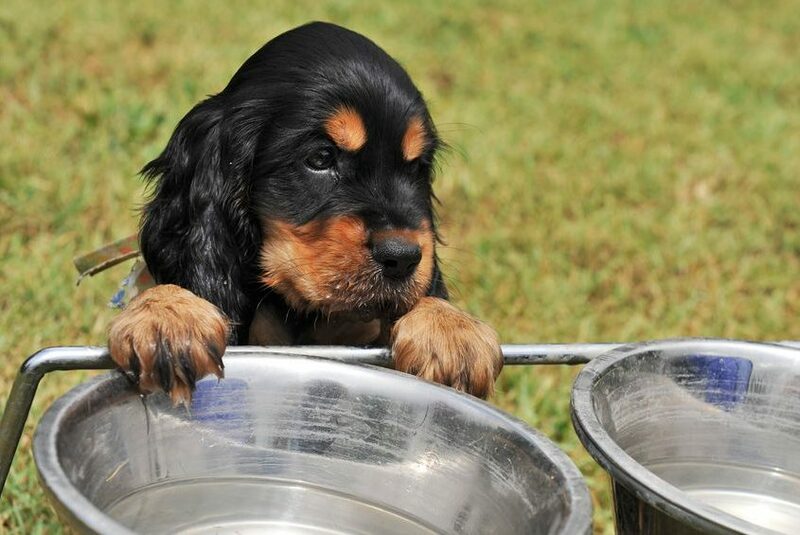 Make sure your pet is getting the right amount of water they need in order to keep them hydrated. Keep an eye out for the more severe symptoms of the heat stroke include diarrhea along with vomiting and body temperature shooting over 1040 F.
If you need to remain outdoors in midday, then make sure that your fluffy ones don’t get exposed to direct sunlight. You can arrange a shady place to cut them off from the harsh sun. Warning! Remember that your flurry members don’t have shoes and their padded paws may get burnt or hurt if got in contact with asphalt or hot sand. Some of the pocket pets such as the ferrets, guinea pigs, and rabbits are generally kept indoors when the scorching sun rays get over 2000 C.
Use of ice or cold water is an excellent way to cool your pet’s body temperature. But it not advisable to provide them with the ice blocks directly. You can feed the blocks along with the fresh veggies and other kibbles for the rabbits, dogs, and guinea pigs. For small pets like ferrets, you can fill a bottle with milk or juice along with some water and let it freeze overnight. The next day, place the same bottle in their enclosure and you will find them nibbling at the bottle whole day long. Most of the animals enjoy drinking water from fountains. My pet cat, Milo, has the tendency to sit outside the washroom and blink towards me. This is Milo’s way of hinting that he wants me to open the sink faucet so he can drink fresh water. I always follow his request! Some of the pets enjoy munching on frozen treats like ice cream, chilled cucumber, and other healthy foods. You can also freeze broth into a popsicle to make a yummy cool snack for your pet. Apart from this, you can also treat them with some refreshing and delicious smoothie. A great option, isn’t it? If your dog has a thick coat of fur make sure you’re taking extra care of them during these hot months. Clip their coat carefully, so that they don’t feel sunburn or heat. 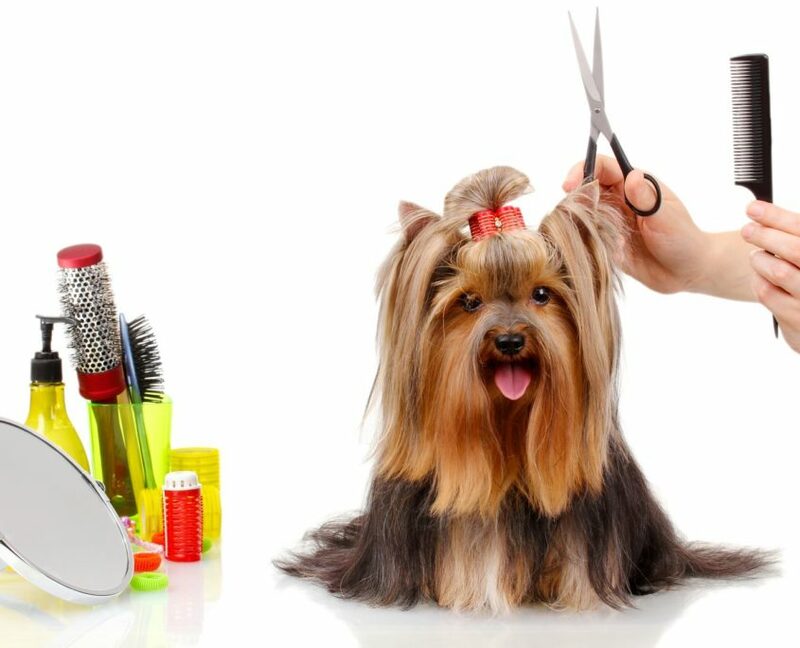 The undercoat is the natural cooling system of your pets. However, if the fur cover is not properly managed, then it will become matted and will block the air flow via its skin. Different pet breeds have different needs. Make use of internet resources to determine what your pet needs specifically, that way you can keep them nice and cool this summer! So what are you waiting for? Share your tips on how to keep the pets hydrated with all your friend and relatives, especially when the temperature is above the average. Lyuthar Jacob blogs for couponsmonk.com. Here in the above post, he is sharing about why 7 Incredible Ways To Keep Your Pet Hydrated This Summer.